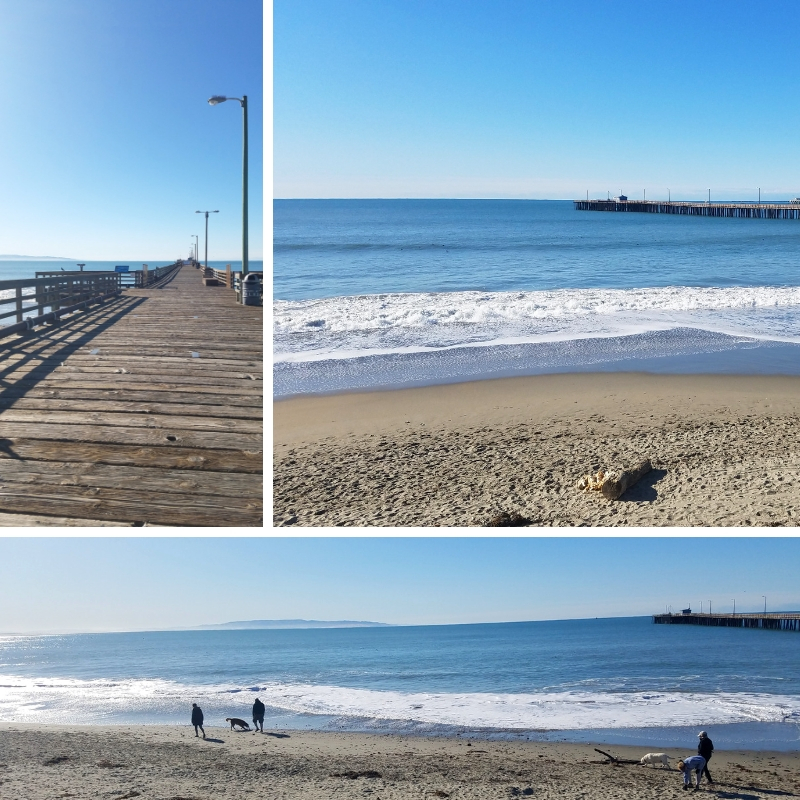 California’s Central Coast is filled with many family-owned boutique wineries and they also have some beautiful beaches! It makes for an easy weekend getaway, being only about a 2-3 hour scenic drive from Los Angeles. 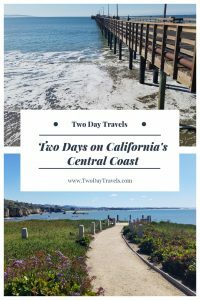 While there are numerous small beach towns in California, these are definitely worth putting on the itinerary for your next California road trip! My first stop was Monarch Grove Winery, located in Grover Beach. 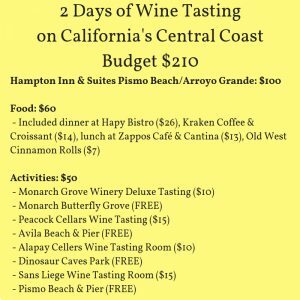 Sharing the same parking lot as the Amtrak Train Station (good to know if you want to take the Coast Starlight Train and make some wine tasting stops along the way! ), this small tasting room offers delicious wines made from locally sourced grapes. They offer a Flight of Six ($6) or a Deluxe Tasting that includes 7 wines with chocolate, cheese & crackers ($10). I enjoyed their Monarch Nectar, an Orange Muscato they refer to as their “patio sipper” and it would be absolutely perfect on a warm summer night! Their hibiscus sparkling wine (Monarch Bubbles) will be another favorite of mine this summer. I also enjoyed their Chardonnay, Pinot Noir, She Said Red (a blend of Sangiovese, Merlot, and Cab Franc) and both a regular and Port version of their He Said Red, which is a blend of Petite Sirah, Malbec, and Zinfandel. 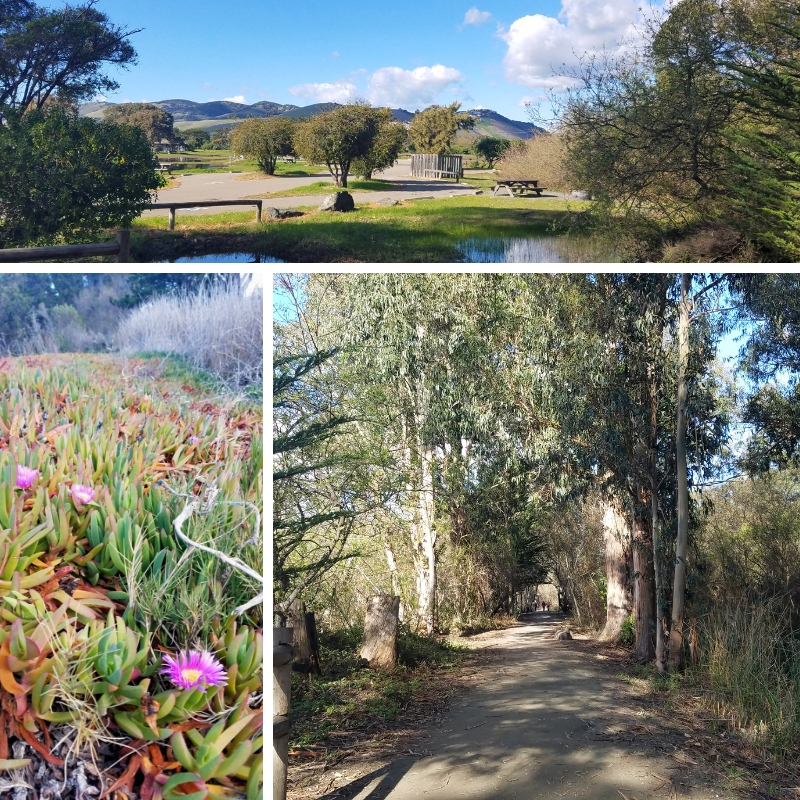 Just a few blocks down the road from the wine tasting room is the Monarch Butterfly Grove. This small area, filled with Eucalyptus trees, attracts thousands of monarch butterflies each year. You can walk amongst the trees in this reserve and observe the monarchs as they cluster together in the treetops. It looks like autumn and as if the leaves were changing colors, but those orange leaves are actually the butterflies! The grove is open during the monarchs’ migration period from late October to the end of February. Although there was a much smaller population this year (approximately 5,000 monarchs versus the usual 15,000), it was still very impressive to see. 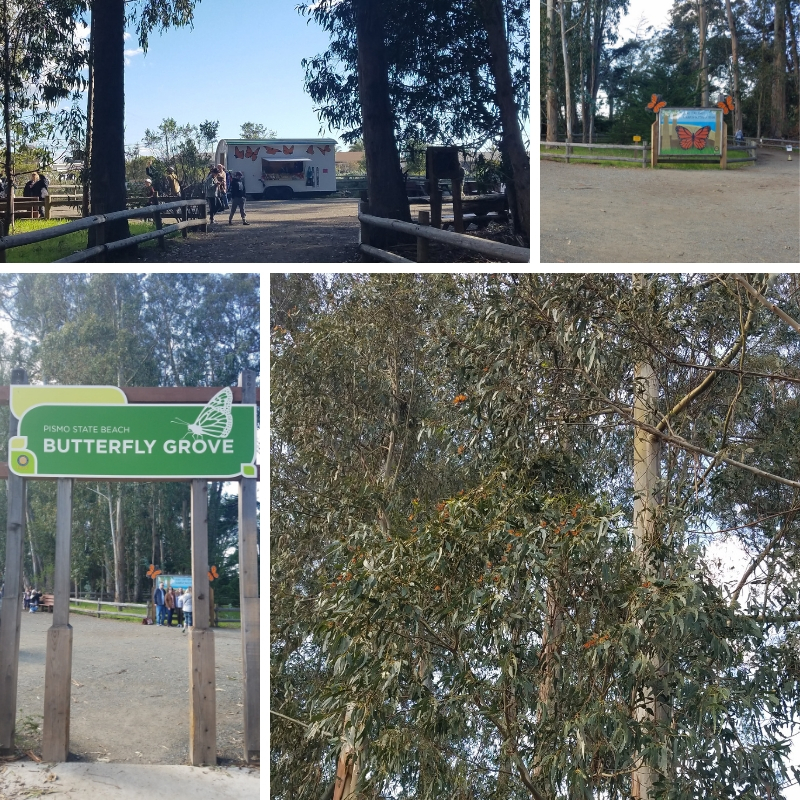 From the Butterfly Grove, you can walk along the trails to the North Beach Campground or down to the beach area. 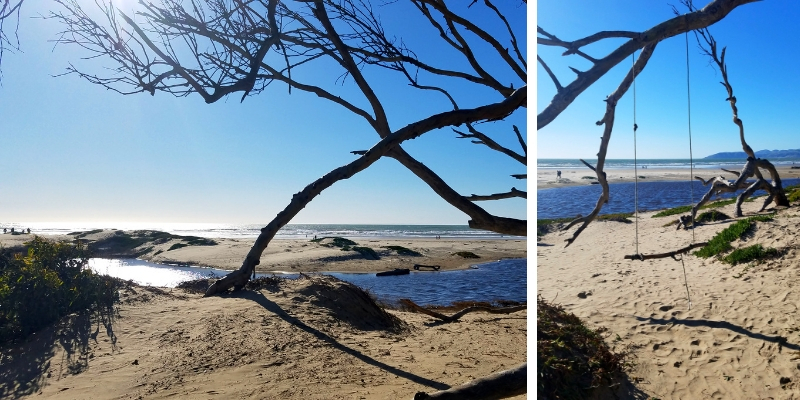 I enjoyed a short walk along the trails and the picturesque beach. 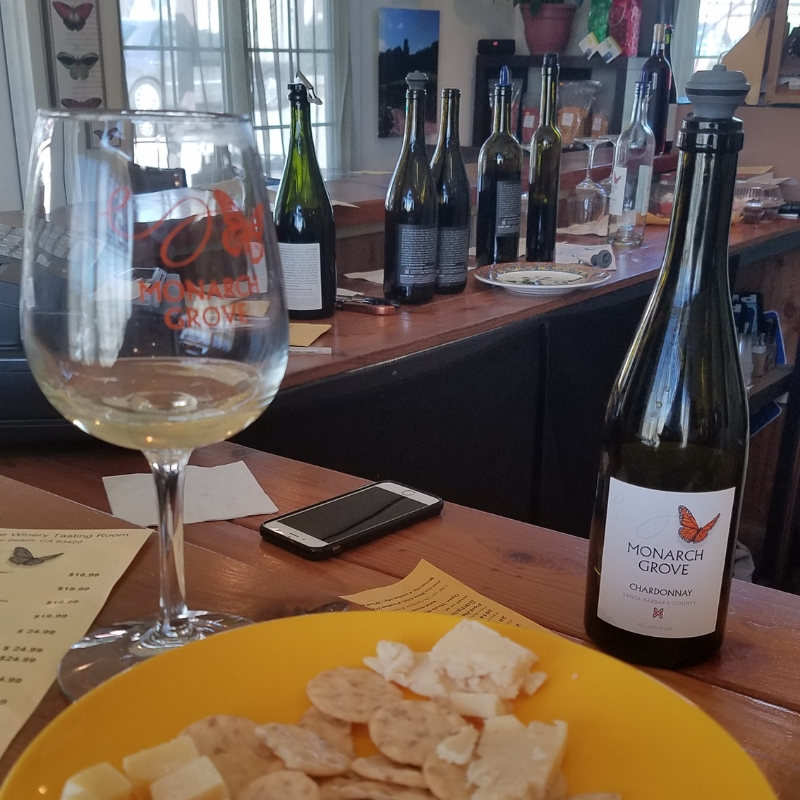 The winemaker at Monarch Grove recommended Peacock Cellars, so I headed there to check them out. This award-winning winery focuses on producing small quantities of exceptional wines. Not only do they grow most of their own grapes, but they also are known for growing high-quality tomatoes and other produce. 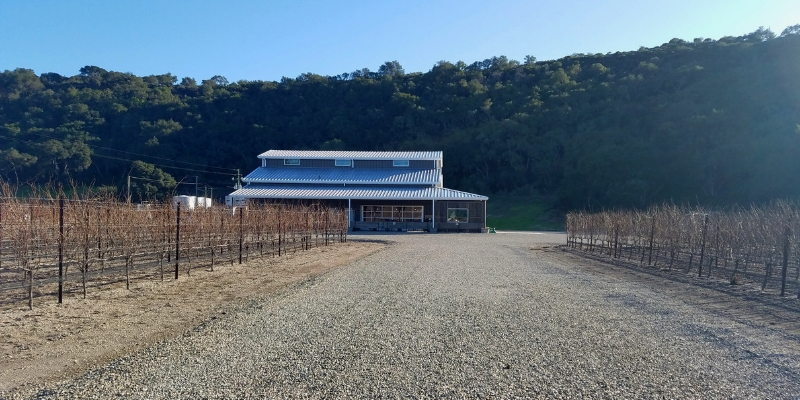 Their tasting room and farm stand, where they sell their wines, produce, fresh baked goods, homemade jams, and other gifts, is situated within the grounds of one of their vineyards. With a patio overlooking the vines, it makes for a lovely place to spend an afternoon with a glass of wine and some friends enjoying coastal California’s warm and sunny days! 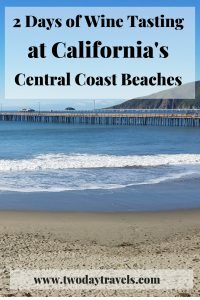 The next morning, I drove a little north to Avila Beach and found a great craft coffee shop. 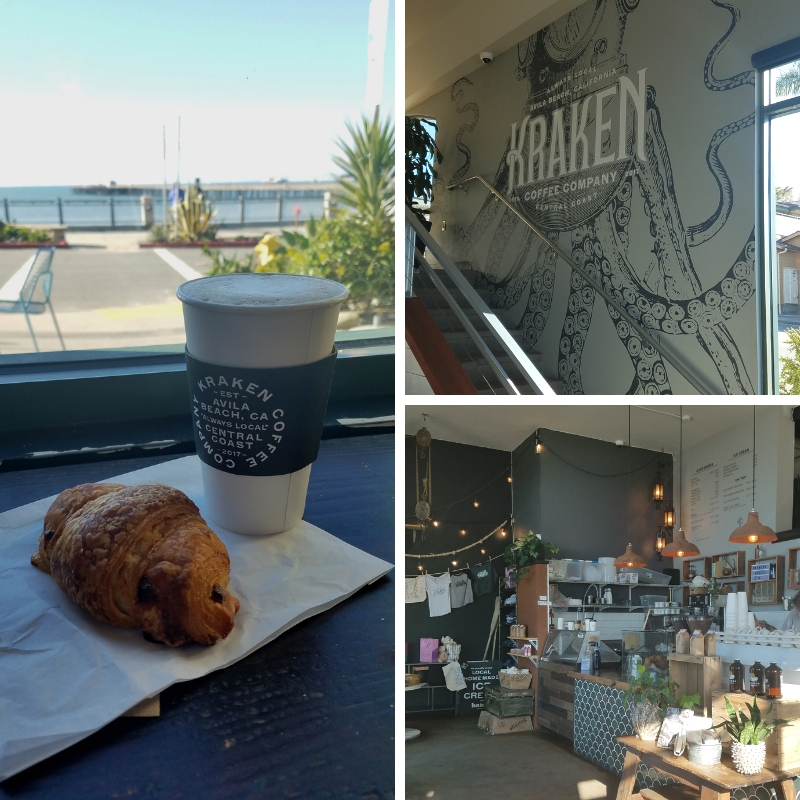 Kraken Coffee Company offers friendly service, good coffee and pastries, and an stunning view! As it was still a little early, there weren’t any crowds yet, and I meandered along the beachfront and pier for a short while. There were a few morning dog walkers enjoying the warm sun and calm waters. The promenade is lined with stores and restaurants that were just starting to wake up. I wandered through a couple of the stores just to see what they had. While they are the expected touristy products, I found them to be a little nicer and slightly more upscale than your usual souvenir shops, filled with beautiful clothes, summer hats, and fun, beachy home décor. 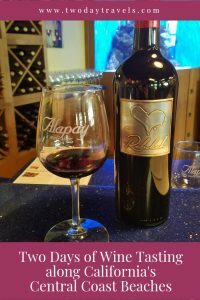 I was one of the first guests to Alapay’s Wine Tasting Room this morning, and as such got to chat quite a bit with one of the owners, Scott Remmenga. Scott and his wife Rebecca have been making wine for over 18 years and started this winery in 2001. They produce small quantities (only ~5,000 cases a year) that are only available in their wine tasting room and to their club members. 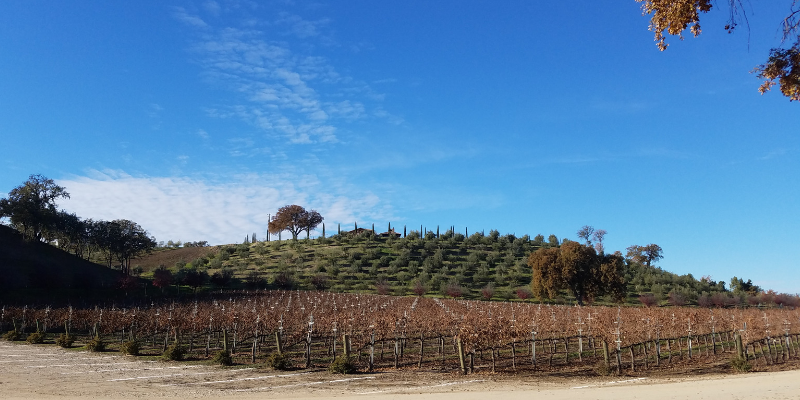 Their award-winning wines are all made with grapes from local, Central California vineyards. While I was enjoying their wines, Scott regaled me with some history of the area. 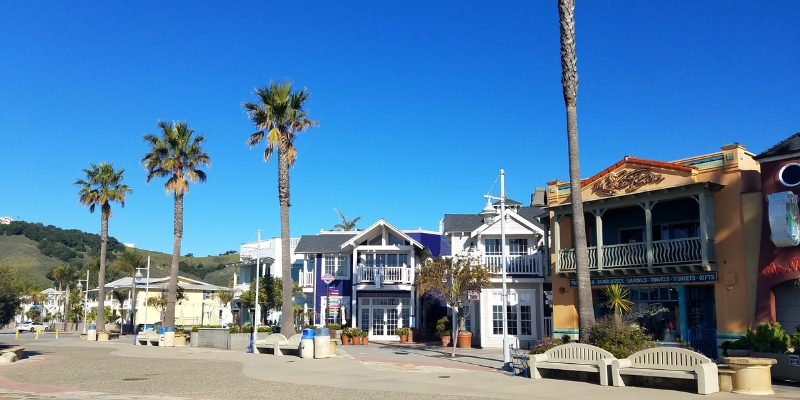 One of the stories I found most interesting was how the downtown Avila Beach area had been razed and rebuilt between 1998 and 2000 after an underground oil spill was discovered. Apparently, the clay pipes that ran under the city had been leaking since the 1940s! As a result of the renovation, many of the homes and business were reconstructed, lending to the “fresher and newer” appearance I felt while walking through the city that morning. After the wine tasting, I headed over to Shell Beach to see the Dinosaur Caves Park. Now, don’t get too excited, there aren’t actually dinosaurs there. 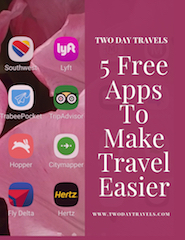 The name comes from 1940s-50s era 50-foot plaster Brontosaurus that was built as a tourist attraction to lure drivers from the Pacific Coast Highway to a souvenir, lapidary, and bait shop. At the tail of the dinosaur was a sea cave visitors could explore. 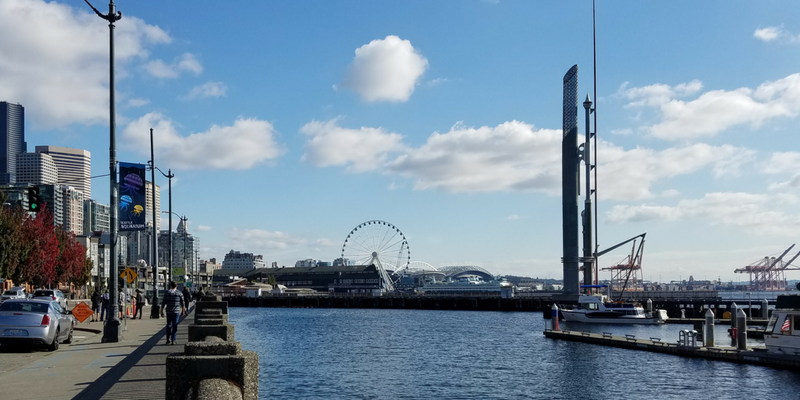 And, although the 50-foot dinosaur no longer exists (having been dismantled in the early 1960s), the name for the area remains. While the park itself was your basic, city park with a playground and some benches, the views along the walkway were gorgeous! 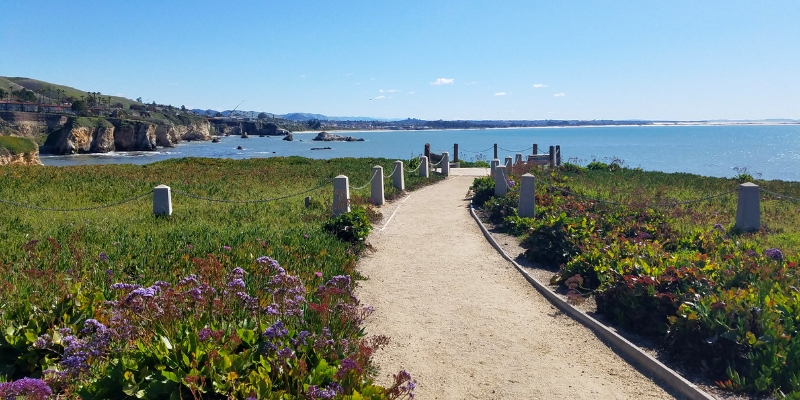 A walking path ran the length of the bluff allowing you stunning views of the water and coastline. 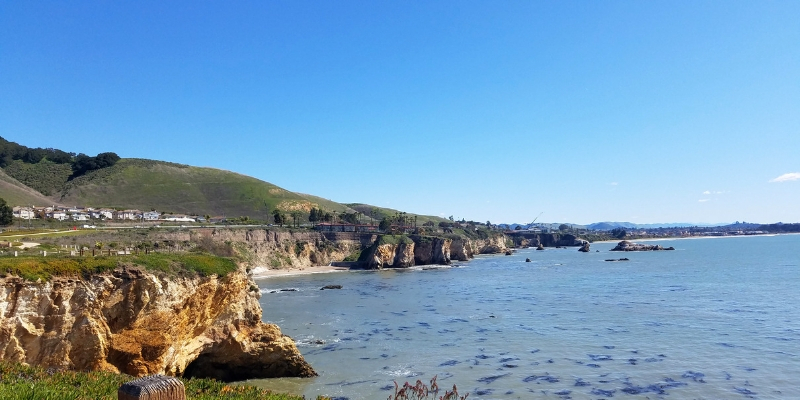 Pismo Beach was once known as the “Clam Capital of the World” and is still famous for its clams and award-winning clam chowder. 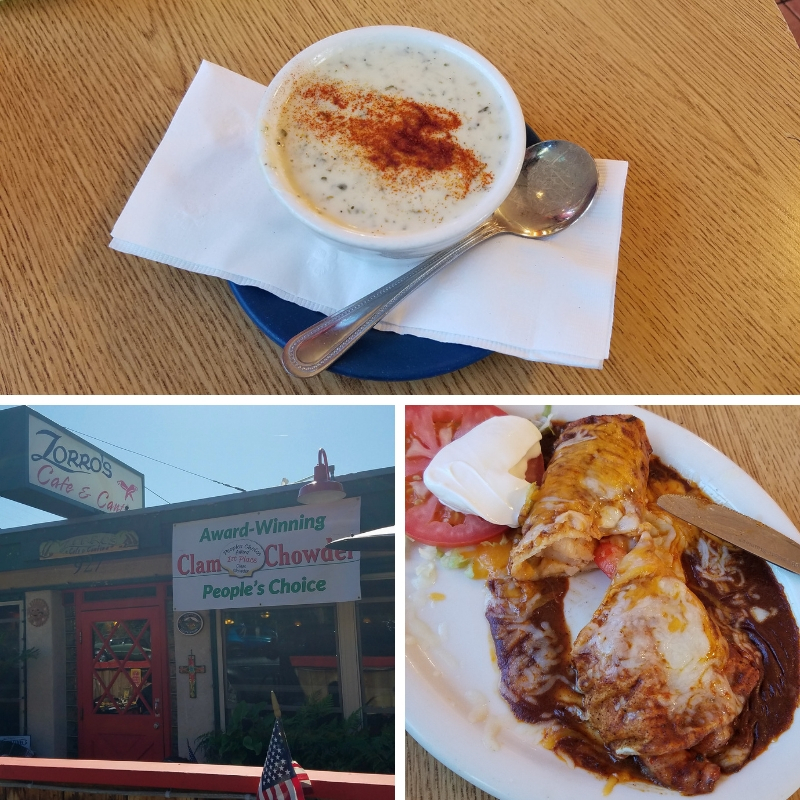 While browsing one of the shops earlier that morning, I asked the shopkeeper for a recommendation of the best clam chowder in the area and she enthusiastically suggested Zorros Café & Cantina. Although a Mexican restaurant, they do have excellent clam chowder! They offered great food, a fun atmosphere, and excellent service. I ordered a bowl of the clam chowder and a shrimp enchilada. Both were extremely delicious and it was a perfect lunch! 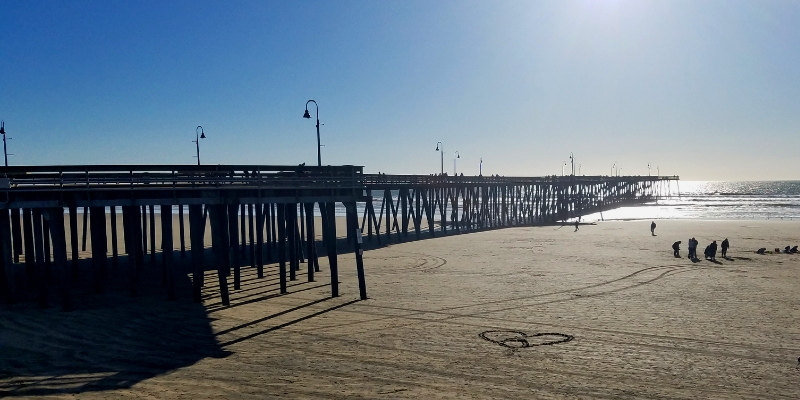 The original Pismo Beach Pier was built in 1924 and has been renovated numerous times over the past 90+ years to keep it in tip-top condition. 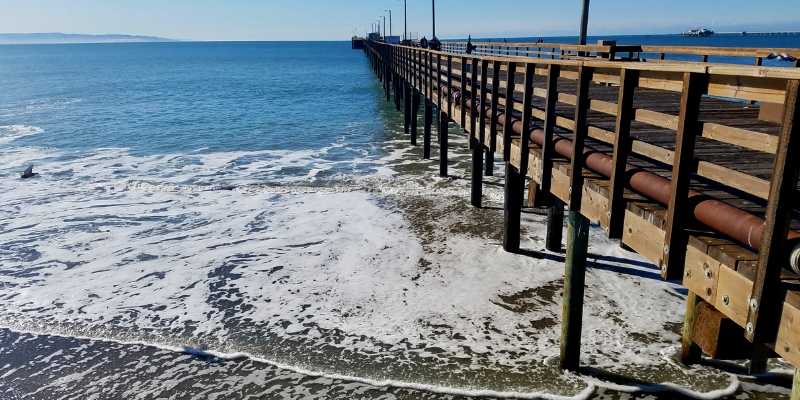 The streets along the pier and downtown area all have that iconic small-beach-town feel with surf shops, old school diners hyping their chowder, and lots of souvenir shops selling everything from sunblock to key chains to homemade soaps. 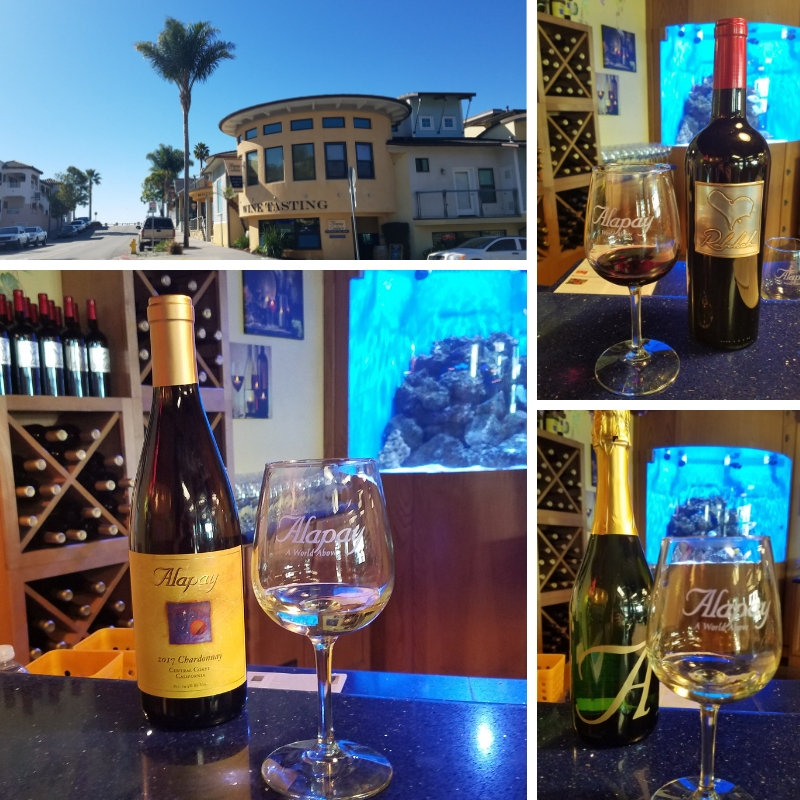 Right in the heart of Pismo Beach is the Sans Liege Wine Tasting Room. 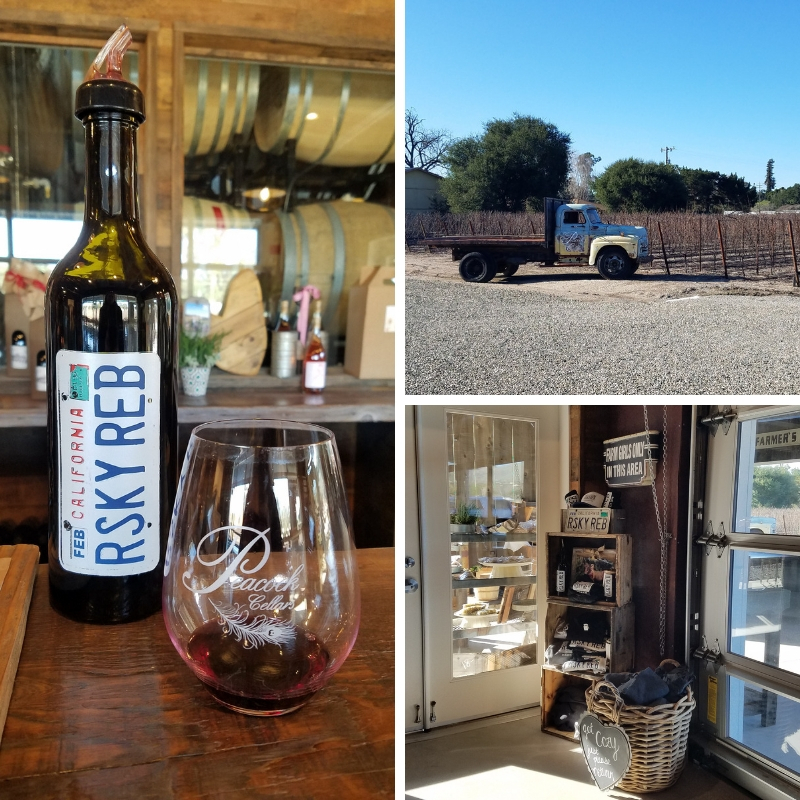 This wonderful boutique winery celebrates the local grapes in the central coast and has tasting rooms both in Pismo Beach and Paso Robles’ Tin City area. 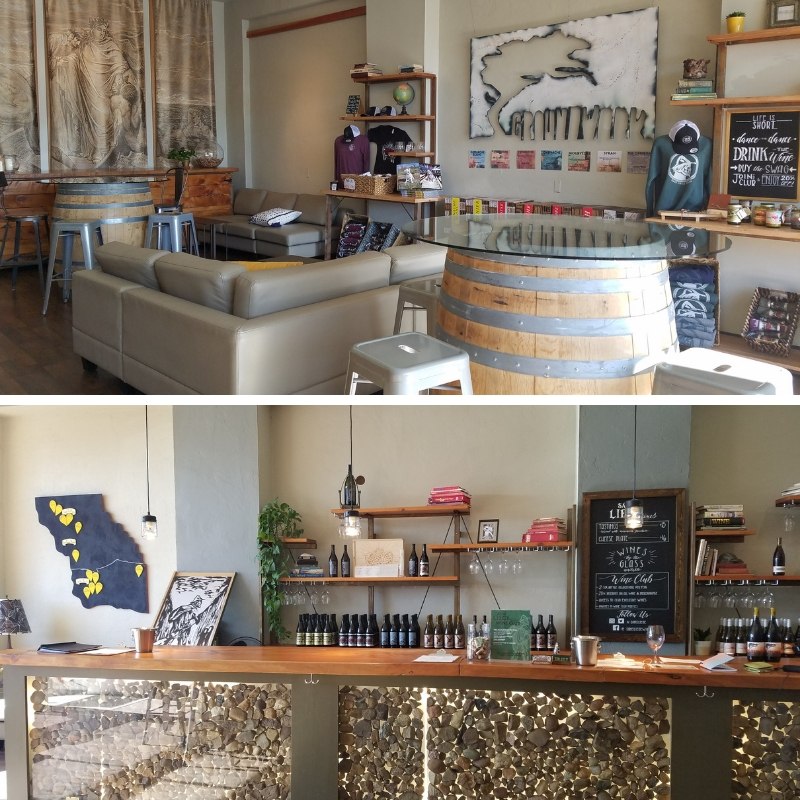 Once again I got lucky and entered the tasting room during a lull in the afternoon, so enjoyed a delightful one-on-one conversation with their server, Jessica who told me all about their wines, the winemaker and their influences. She also shared with me a local’s view of the city, what it was like to live there and even recommended the Old West Cinnamon Shop for a fun treat just down the road that she used to enjoy visiting with her grandfather! In addition to the taste of the wines, another thing I found interesting was their label artwork. Influenced both by German Expressionism and Dante’s Inferno, their labels are a representation of their wines: a nuanced mash-up nodding to a classic heritage and modern-day independence. While I enjoyed all of the wines I tried, I especially liked their 2016 Groundwork Syrah. I found it to be a little bit sweeter than usual but still carried a big flavor. 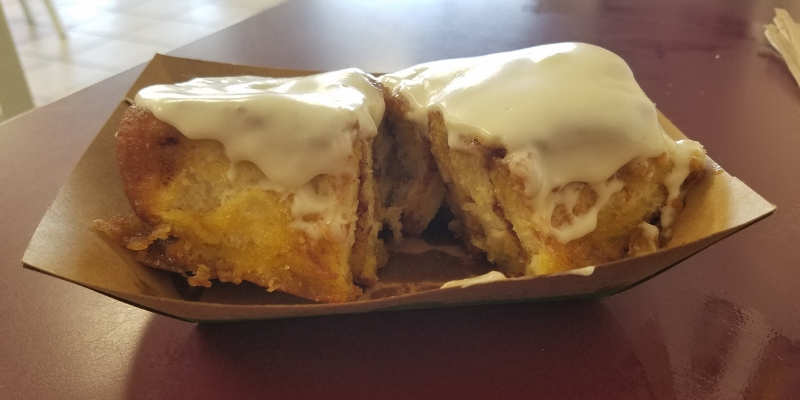 On Jessica’s advice, I did stop at Old West Cinnamon Rolls before heading home. This vintage bakery serves up their old school cinnamon rolls alongside espressos and smoothies. They are delicious, warm, sticky, gooey treats that make you feel like a kid again! I found this hotel perfect for a one-night stay (although truthfully I might choose something more along the ocean if I was staying multiple nights). 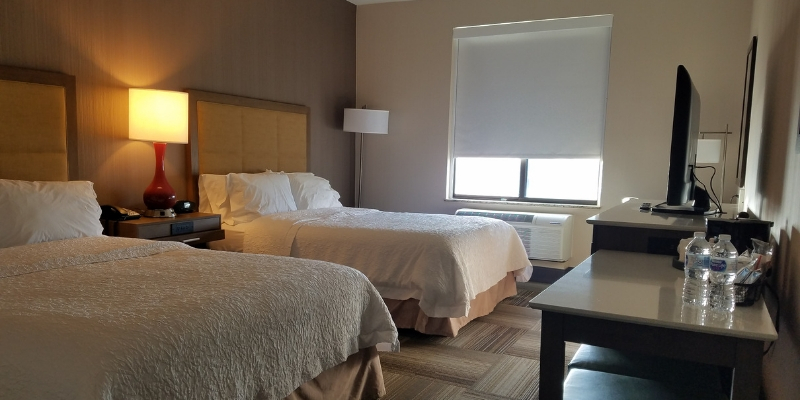 As usual with the Hampton Inn & Suites, they offered a clean, spacious room with a peek-a-boo view of the ocean, plus a morning breakfast buffet and coffee available all day. 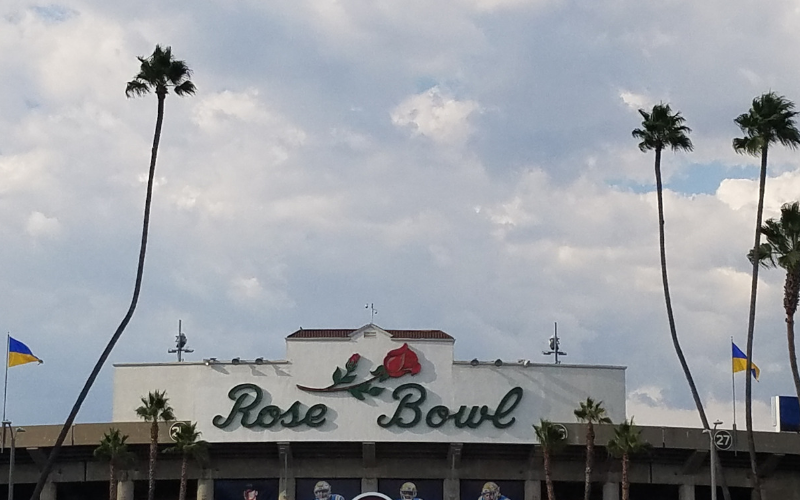 They also had ample parking and very easy access to freeway. It was perfect for a one-night stay. You adventures always sould like so much fun, Cynthia. Thank you, Karla! We have to plan an adventure you can take with me some day!! Oh, don’t worry, Danik – there are plenty of craft breweries in California and along the Central Coast! You will both enjoy a visit here! These wineries look so cute! And so convenient that they’re close to the beach. I have been to Napa and Sonoma but never these, I’ll have to go back and check them out! It was fun to have both the beaches and wineries so close together – kind of the best of all worlds! Thank you. Looks like you’ve just laid out my next visit home. Happy to help! I am also happy to show you around in person when you make it back! I hope she enjoys her visit! Have her email me if she would like any advice for a specific area of California. This might be one of my favorite blogs. Not sure exactly why, but loved the inside and outside photos, a share of all things good that you enjoyed and wrote about. And of course = who doesn’t love the ocean and wine? Thank you!! I’m so glad you liked it, and I absolutely agree – what’s not to love about the ocean and wine?!?! That looks heavenly! Sounds like a wonderful time! 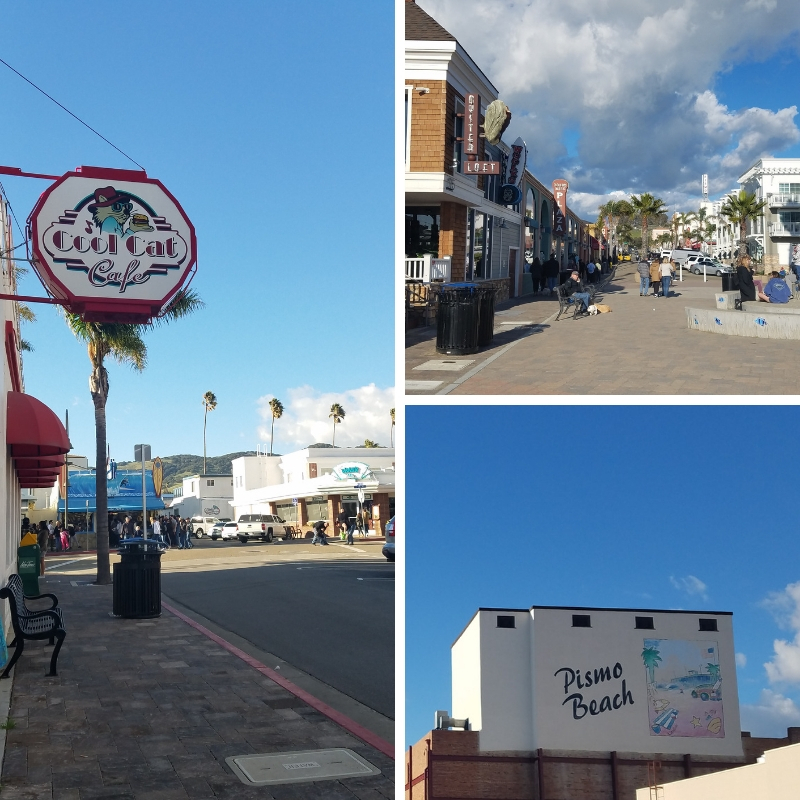 That’s really interesting that they had to rebuild after the underground oil spill – I love that they made the most of it by creating such a fresh, lively town! I’ve not been to this part of Cali, but I now I really want to! It was really interesting to hear about the renovation, because I truly had felt the difference between their downtown area and the others nearby, but couldn’t quite explain what it was. It’s a great area, I hope you get to visit! So many places for wine tasting. Must be heaven for wine lovers. Too bad, I never had wine in my like. Looks like I have to have a taste of it. Wine tasting sessions are a great way to try different wines and learn about their tastes, without committing to a full glass of something you might not like! Wine tasting along the central coast seems to be a really heady experience. Apart from the wine, the places all offer some amazing experiences with nature. I was especially interested in reading about the Monarch Grove. It is amazing to note that Monarch Butterflies congregate here during the migratory season and present a visual treat to visitors. Well that just looks like the best two days! Definitely something to put on my wishlist! And I think I’d have to time it with the butterfly migration because that just looks spectacular. It was really interesting to see the butterflies, I’m glad I was there at that time! I loved this part of California when I visited last year! It looks like you made it to quite a few more wineries than I did (jealous!). I hadn’t heard of Monarch Butterfly Grove, but I’d love to check that out! 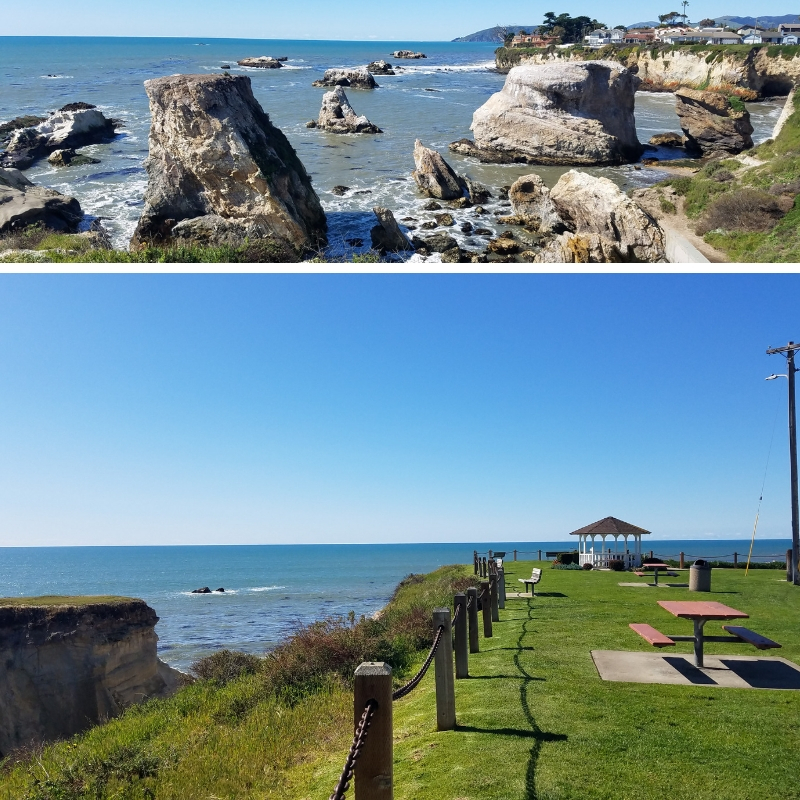 When I visited, I made it down to Monterey and Big Sur, but it looks like Pismo Beach has a lot to offer as well!